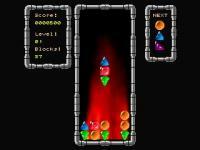 Description: A gem puzzle game. Quite nice. it should also feature nice graphics and sound. mixer will now hopefully work on big-endian machines. and there is no music. Windows users might experience some bugs. which must be compiled and installed from source. For instructions on building the game se the file INSTALL. up/down arrows to cycle it's tiles and right shift to make it fall faster. Get three same pieces in a row (horizontal/vertical/diagonal) and boom! they dissappear and your score increases. You can earn even more points by inflicting chain reactions. fall, and, forming a new line, explode again. inserted to the bottom of his playing board. During gameplay, you can make a screenshot by presing the PrintScreen key. "blockrage-scr.pcx". (This will not work in the menu). chooses a dataset. the format is identical to the format of blockrage.cfg. the users, create a shared topten table, etc). After processing the .rc file, the config files are processed. <sys-config-file>. If that cannot be found either, defaults are assumed. The config file contains the key bindings, starting level, tileset, etc. This README describes version 0.2.3 of Block Rage. The Block Rage homepage at <http://blockrage.sourceforge.net>.